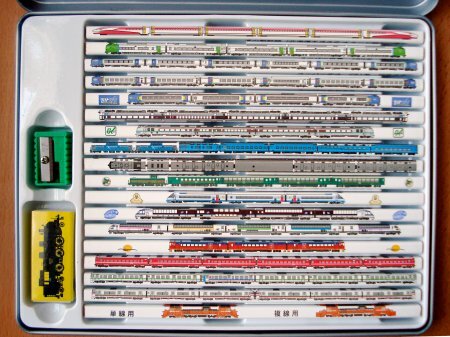 Another magnificent set of pencils in tribute to the Japanese railway system. This is a set of 18 colour pencils, housed in a tin case, and made by the esteemed Mitsubishi Pencil Co. Interesting as pencils, they are also amazing reflections of other realms. Very nice collection piece. Wonder if any of the Japanese stationery stores in California might carry them. Oh to be a Japanese schoolkid! I note the map on the pencil tin, so is this set the trains of Hokkaido as opposed to Japan in general? kiwi-d, that is probably the case. This article says the Japan Railways Group has several members, including JR Hokkaido. Yes, these pencils were made by Mitsubishi for the Hokkaido Kiosk Corporation, this corporation operates the kiosks at JR Hokkaido so technically these pens are not issued in any way by JR. They are sold as gifts/souvenirs. The inner lid identifies the different colours with different train lines. 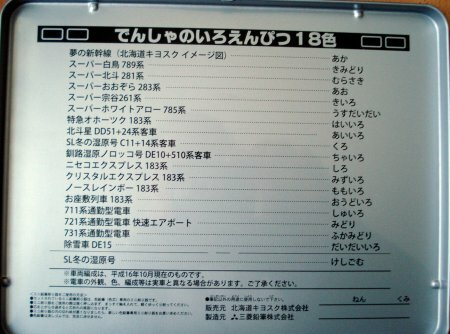 Interestingly it also contains a space for elementary school students to write their name, class and school year. Robert, thanks for sharing this information with us. I would love to buy those. Do you have any idea where to get them? Thanks! 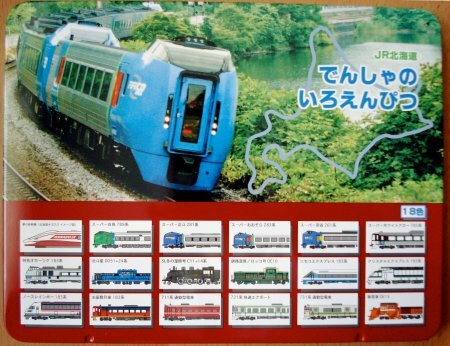 I have 3 sets of these Mitsubishi pencil sets – with trains and buses from the Kansai Area, circa 2005-2007. All sets are in new condition with eraser and pencil sharpener. All pencils unused, and the tin cases are as new, although there may be a couple of minor scuffs as they have been in my sons cupboard for the last 10 years.